What a wonderful day! It felt like everyone had come out to join us. I arrived at the parade start point at about 10:30am and was joined by more and more BiTopia members until it was time to start marching. Whilst we were waiting we took photos, played with poi, and even got interviewed by Notts TV! (I’m still not sure if we actually made it onto the news though.) The weather was boiling, but sunny and there was a fantastic festival feel in the city centre as the parade snaked slowly round the streets. Some of us held the banner, others handed out stickers and leaflets. Most of us were either wearing or waving bisexual/rainbow flags. During the parade a few people came up to look at our banner and ask who we are. Some people took our picture and some even stayed to march with us! After the parade ended about half of us stayed together to go for lunch, then we wondered round the stalls and stages before heading our separate ways. As someone who has experienced biphobic abuse at Prides in the past, I’m always a bit nervous about attending but I didn’t have any problems at all this Pride. I was also delighted to discover two of the stalls were selling bisexual related merchandise, as at most Prides I’ve been to there is only gay, lesbian and rainbow merchandise for sale. 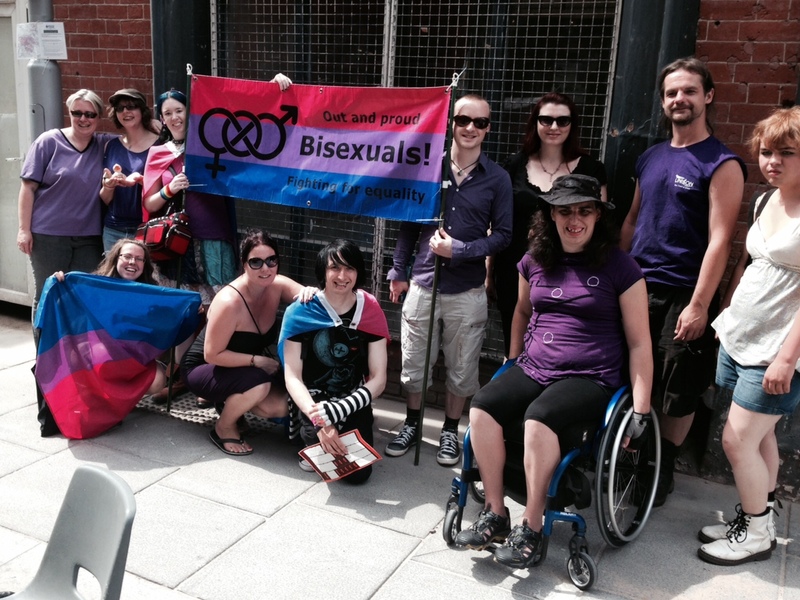 These kind of events are so important for bi visibility and reducing bi erasure, so I’m really happy and proud we managed to get such a large presence at Pride. There were about 20 people for the parade, which is amazing considering we’ve only been running for 7 months. As I said before, what a wonderful day!